Menulog delivers for Tandoori Dhaba - Petersham so you'll be able to track your courier on a map. 2 x Any Curries, 3 x Mix Naan, 2 x Rice, 1 x Bag of Pappadum, 1 x Raita. 3 x Any Curries, 4 x Mix naan, 2 x Rice, 1 x Bag of Pappadum, 1 x Raita. 4 x Any Curries, 5 x Naan, 3 x Rice, 1 x Bag of Papadam, 2 x Raita. Light pastry pocket filled with lamb mince and a mixture of delicately spiced green peas served with tamarind chutney. Tender chicken fillets marinated with garlic, ginger, fresh lemon squeeze, yoghurt, spices and Indian herbs and roasted in tandoori oven. Tender lamb cutlets marinated with garlic, ginger, fresh lemon squeeze, yoghurt, spices and Indian herbs and roasted in the tandoori oven. Lamb minced marinated with ginger, garlic fresh coriander & special Indian spices, skewered and roasted in the tandoori oven. Pieces of juicy fish marinated in mint and yoghurt and cooked in Tandoor. Crunchy onion fritters served with mint chutney. A delicious combination of mixed vegetables and spices wrapped in light pastry, deep fried and served with tamarind sauces. Marinated cottage cheese smoked roasted with tandoori capsicum & onion salad. Short pastry served with sweet and mint yoghurt and tamarind sauce. Delicious mix vegetable samosa served with cooked chickpea fresh onion, green chilli, coriander and tasty spice yoghurt. Specialty of the house aromatic rice and tender pieces of marinated lamb, chicken, beef, goat, prawn, fish or vegetables cooked together with assorted of freshly ground herbs and spices. Oven roasted cheese cooked with onion, capsicum, tomato and special masala sauce. Homemade cheese cooked with special spices, capsicum and special sauce. Chicken marinated overnight with garlic, ginger, fresh lemon squeeze, yoghurt, spices and Indian herbs roasted in the tandoori oven. Tender chicken fillets marinated with garlic, ginerg, fresh lemon squeeze, yoghurt, spices and Indian herbs roasted in the tandoori oven. Fish fillets marinated with yoghurt, mint, coriander, green chillies and roasted in the tandoor oven. Combination of tandoori lamb cutlet, chicken tikka, fish and prawn served on sizzler. Tender lamb cutlets marinated with garlic, ginger, fresh lemon squeeze, yoghurt, spices and Indian herbs roasted in the tandoori oven. Mixed dal cooked with fresh tomato, onion, ginger and garlic garnished with fresh coriander. Croquettes potatoes with grated cottage cheese and raisins simmered in a cashew nut and creamy sauce. The freshest seasonally available vegetable with a delicious almond and cashew nut curry sauce. Mixed seasonal vegetables with tomatoes, onions, capsicum and ginger in a thick curry sauce. Diced potato with green peas cooked in chef special curry sauce. Chickpea cooked with tomato, onion, masala sauce and chef's special spices. A classic Indian recipe using homemade cottage cheese and fresh English spinach. Chicken fillets cooked with capsicum, tomatoes, onions, green chillies and ginger in a light curry sauce. Traditional hot chicken curry from Goa, cooked in homemade vindaloo curry sauce with hot spices. Tender chicken fillet cooked in a tandoori oven then blended with sauteed onions, capsicum and fresh cream. Boneless chicken fillets cooked South Indian style with mustard seed, black pepper and curry leaves. Tender chicken fillets cooked with almond and cashew nut curry sauce. 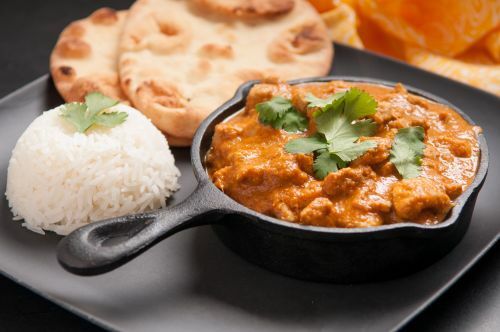 A Indian flavour specialty, chicken fillets from the tandoor served in a creamy red butter masala sauce. A mouth watering delicious chicken pieces cooked in a fresh mango pulp and thicken creamy sauce. Special dish from Madras cooked with roasted mustard seeds and coconut milk. Traditional hot beef curry from Goa, juicy pieces of beef cooked in homemade vindaloo curry sauce with hot spices. Goat meat on the bone, cooked in traditional Indian styles, spices with onion, tomatoes and turmeric popular all over India. Cubed lamb cooked with tomato, chef's special rogan josh sauce, methi and coriander leaves. Tender diced lamb cooked with almond and cashew nut curry sauce. Diced lamb with lentils and coriander in a light curry sauce. Special dish from South India, boneless lamb cooked with roasted mustard seeds, coconut milk and chefs special spices. King prawns simmered in coconut milk and spices finished with malabari sauce. Fish fillets lightly cooked in tandoor finished in pan with coriander, capsicum, onion, tomatoes and special spices. King prawns deliciously hot gravy clinging to julienned vegetables garnished with fresh coriander. A Goan special, vinegar marinated king prawn in hot spicy gravvy. Chicken fillets marinated in yoghurt, mint and coriander roasted in the tandoori oven served with fried chips and mint sauce. Fish fillets marinated in yoghurt, mint and coriander roasted in the tandoori oven served with fried chips and mint sauce. Fragnant Basmati rice cooked with cumin seeds and vegetables. Naan stuffed with mushroom, spinach and spices. Buttered & layered wholemeal bread stuffed with potato & spice. Leavened bread cooked in tandoor. Garlic naan stuffed with cheese. Naan with spicy minced lamb. Naan stuffed with dried fruit. Leavened bread stuffed with potato and spiced cooked in tandoor. Plain flour, semilona, milk and almond powder. Fresh milk, semilona, plain flour and vinegar. Milk, vanilla ice cream, condensed milk and blended ripe mango.